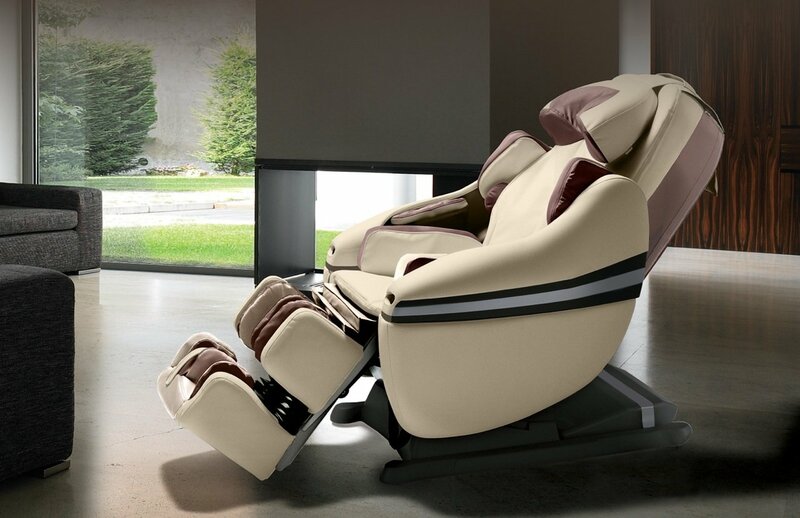 You would be surprised at how much a salon chair says about your business. The best styling chairs will make your customers feel at ease, free of any tensions and ready to have themselves beautified by your service. Additionally, you want the base to rotate when you need it to and to lock securely into place when you need it to be stable. Even if you do not own a beauty parlor, you should seek these same basic features in your home. Inside seat dimensions: 19" Long, 20" Wide. Double-reinforced saddle sticking to prevent ripping and tearing! Color&Design: Classic Black with red color and stylish design which is the perfect addition for your barbershop or beauty salons. Structural durabilities: Made of heavy duty steel frame and high quality foot pump with chrome round base, ensures for years of use. High Density Foam Seat: High density foam for extra comfort when you sit down with the comfortable footrest that all makes it suitable for you. Here is our list of the 5 best salon chairs you can currently purchase online and have delivered directly to your home or business. If you have an at-home salon or plan on doing just a couple of customers per day, this is an excellent choice. It is on the low end of the price range but is still built to last. It features a classic appearance, with a round, chrome-colored base and black chair. It features simple armrests and a footrest for clients to prop their feet up in while they relax. The chair does not swivel, so it is best to use it in a large space. However, it does have a hydraulic pump, so the chair can be raised or lowered to fit your customer’s height. 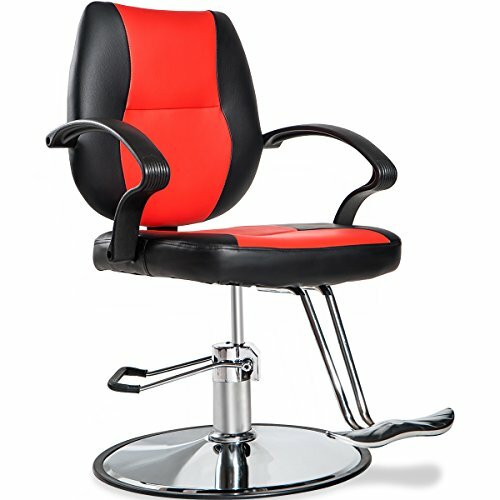 It also tilts back up to 150 degrees, so customers can lean back and relax while you are styling. Another factor that adds to the comfort is the dual-density foam and soft, vinyl exterior of the seat and backrest. The durability of this seat comes from its solid steel construction. Not only will it support your heavier customers, but its stability also disperses the weight evenly across the base of the seat. Additionally, the seat features saddle stitching that has been double reinforced. While the vinyl mimics leather in the way that it is soft, the vinyl also mimics leather in its toughness and its ability to easily wipe clean. The major downside of this chair is that it is hard to assemble. This is caused by some of the holes not lining up with the bolts for the chair. The footrest is also not as comfortable as you would expect it to be. 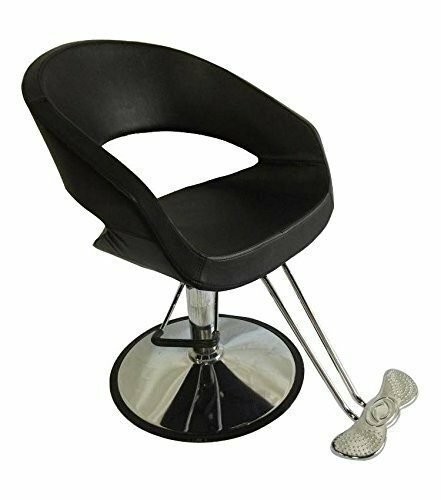 Black and chrome come together for a timeless chair that will fit into any salon décor. The chair and armrests are filled with high-density foam that your customers will sink into for ultimate comfort. This means they can sit for processes like dying hair or straightening that can take hours. 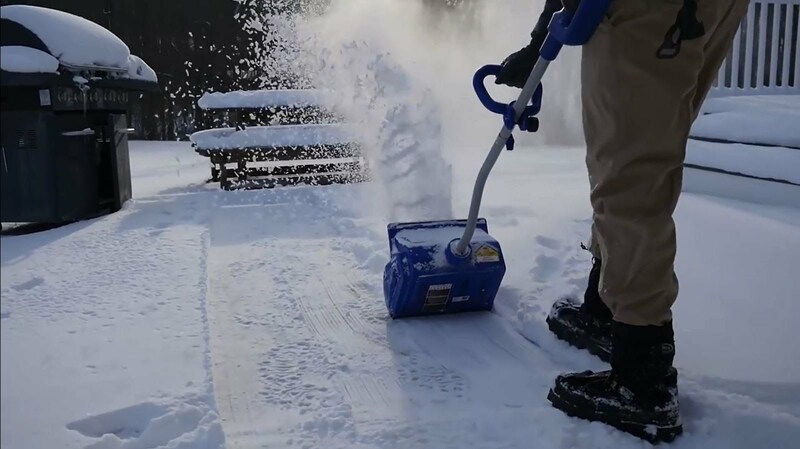 The polyurethane outer is also comfortable and functional, as it easily cleans up between customers. Additionally, the polyurethane material is built to be durable. Beneath this great chair is a solid chrome, round base. It distributes weight evenly to hold customers upright so you do not have to worry about messing up the cut because of an awkwardly positioned chair. 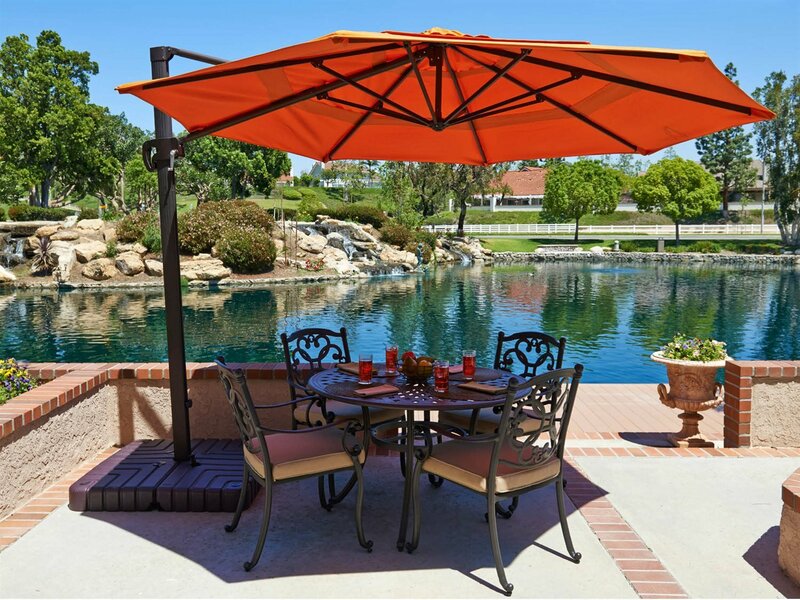 Additionally, the heavy-duty base can safely and securely support weights up to 250 pounds. Another notable feature of this salon chair is the hydraulic pump. 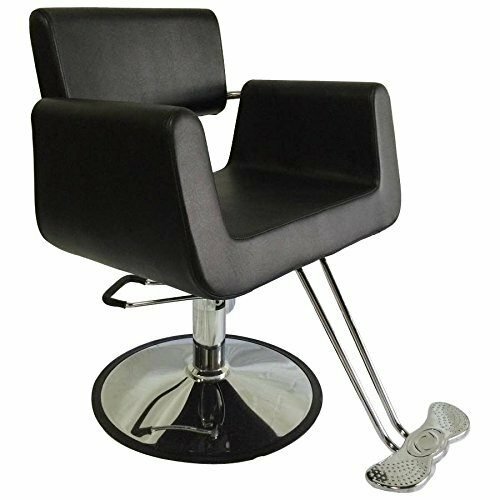 It allows you to quickly and easily adjust the height of the salon chair to accommodate your customers, without needing to ask the customer to stand up so you can adjust it. Finally, a solid, but forgiving footrest ensures customers of any height will be comfortable throughout their sit. The major downside of this chair is assembling it. Often, the hydraulic part comes upside down, so it must be removed and repositioned for the chair to work correctly. Additionally, the armrest screws come screwed into the chair, so you must remove them before positioning the armrest and screwing them back into place. Check out this video if you need a little extra help. This is an affordable, simple chair that is built to last. A steel frame and round, chrome base stabilizes the chair for even weight distribution, able to seat customers up to 250 pounds. The outer cover is stitched using a double reinforcing saddle stitch so that you do not have to worry about it tearing or ripping apart. That helps make this long-lasting purchase worth it. For comfort, this chair features a small cell foam. The high density of this foam lets your customers sink into a relaxing session at the salon. The armrests are also filled with this comfortable foam. Instead of a more traditional footrest, it has a long, rubber coated bar that spans the width of the chair. This means customers have more option of choosing where to stick their feet so they are comfortable. Finally, in terms of functionality, this chair will get the job done. It does not tilt back as some chairs do, but it does swivel a full 360 degrees. The chair also locks into place, both for the swiveling function and the raise/lower function. The raise/lower function is made possible by a powerful, sturdy hydraulic pump that will last as long as the rest of the chair does. Like the previous model, the chair is not as easy to assemble as you would expect and it is highly possible that the hydraulic pump will need re-installed so it is not upside down. Another thing to note is that the backrest does not rise as high as it does on some of the other salon chairs. This means that taller customers may feel a little top heavy or may become uncomfortable, since they do not have anywhere to rest their back. This chair has a sleek, modern design that is a little traditional than the simple backed chairs on this list so far. Instead, it has a wraparound style where the chair and armrests are all as one. 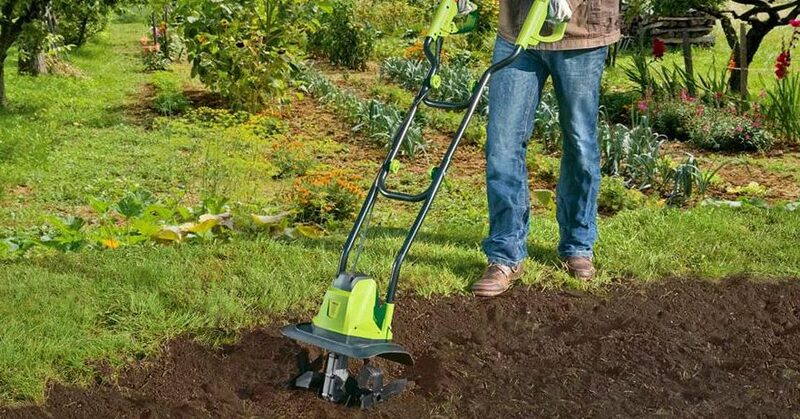 It has a 17” high seat and is an ideal choice for all your customers under 250 pounds. Another great feature of this chair is that the base of the seat is wide enough that a child booster seat could sit on it, which is great if you service children in your shop. The comfort from this chair comes from the specialized footrest, that has wide areas for the customer to place either heel. Additionally, a high density, small cell foam fills the fabric for ideal comfort levels. At the base of the black upper is a stainless steel base and frame, designed to remain sleek but also resist corrosion, rusting, scratches, and other wear and tear. The durability of the frame is complemented by the durability of the chair, which is held together with a saddle stitching that is double-reinforced. Functionality is also at its peak with this chair. It swivels all around and also features a hydraulic pump to lower and raise the chair. 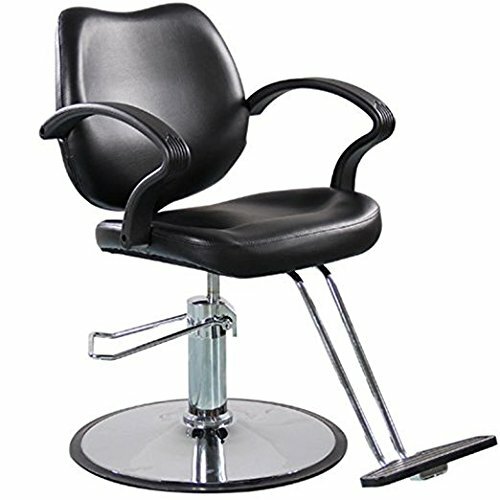 Once in position, you can lock the chair into place so you get the best angle to create the styles your customers deserve. One thing that you should know before purchasing this chair is that the pump does not lift the chair as high as some other options. Stylists that are taller than 5’9” may not feel comfortable using it. There is also a very strong chemical smell that comes from the polyurethane material that the fabric of the outer of the chair is made of. 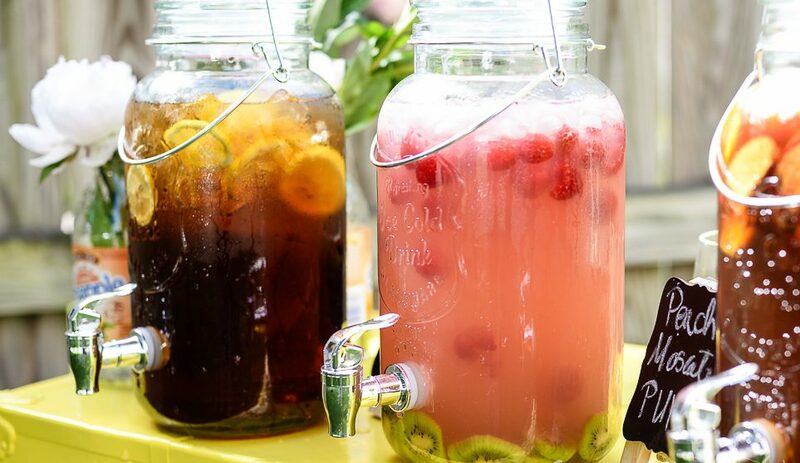 If possible, air it out for a week or two before you start using it to style your customers. This uniquely styled chair has a look that is timeless but on the cutting edge of fashion. Unlike the rounded and oval chairs, this chair is boxy looking. The seat forms a square, which turns up into two wide armrests. 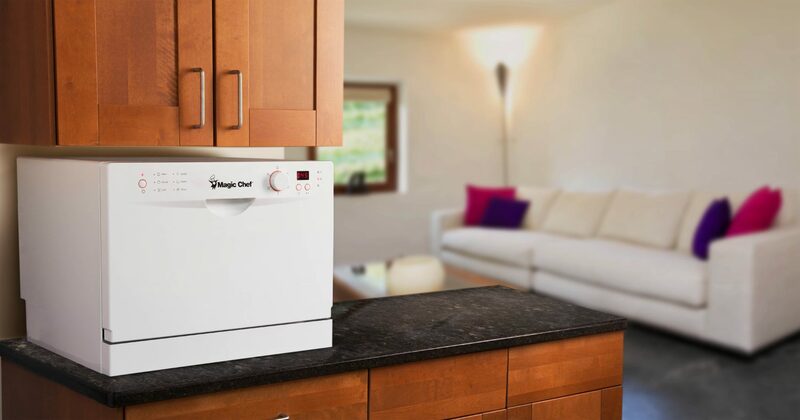 Inside, a high-density foam ensures the highest comfort for your customers. The material that surrounds this foam is attached using an incredibly durable saddle stitching. A 19” backrest ensures that even your tall customers have the comfort and support they need. 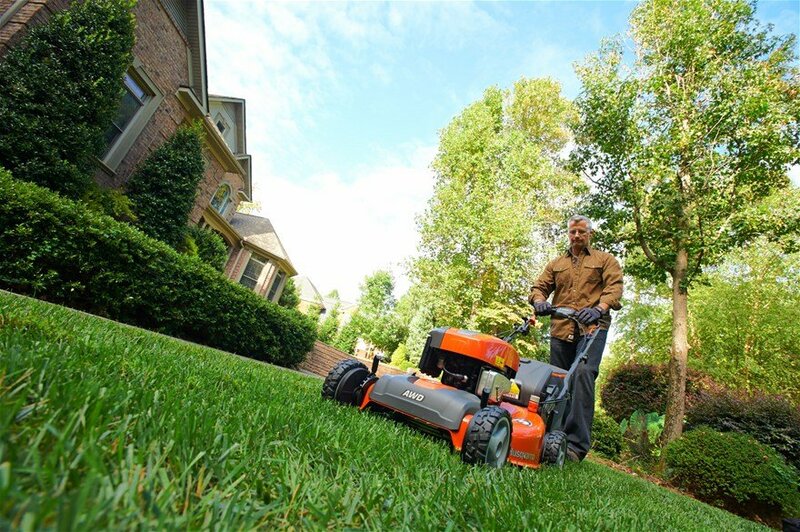 The chair functions by swiveling, as well as raising and lowering using a hydraulic pump. It also locks in place when you are ready. 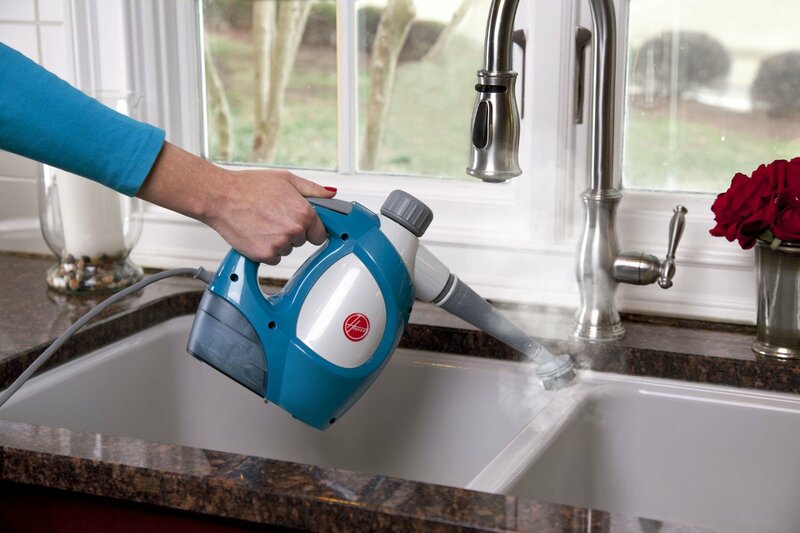 This sturdy pump is affixed on a stainless steel frame that is made to withstand wear and tear and built to last. Additionally, the entire styling chair wipes clean quickly and easily between customers. 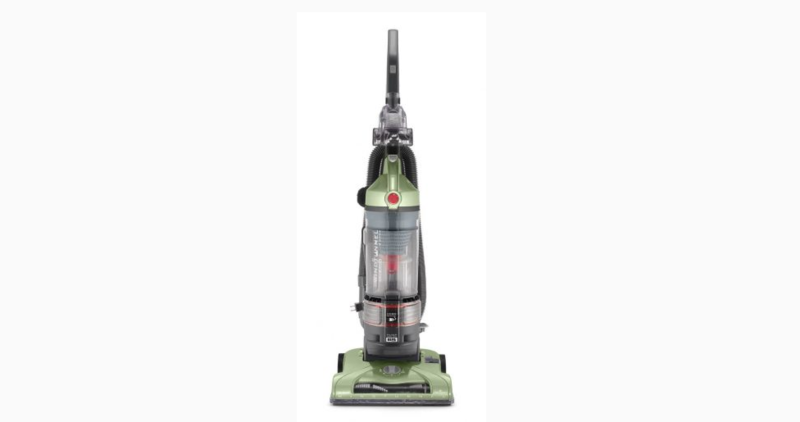 It is able to accommodate customers up to 250 pounds. The major downside of this chair is that the base is very sharp and may even hurt you if you are not careful. The salon chair is also unstable if a tall customer leans forward too much. 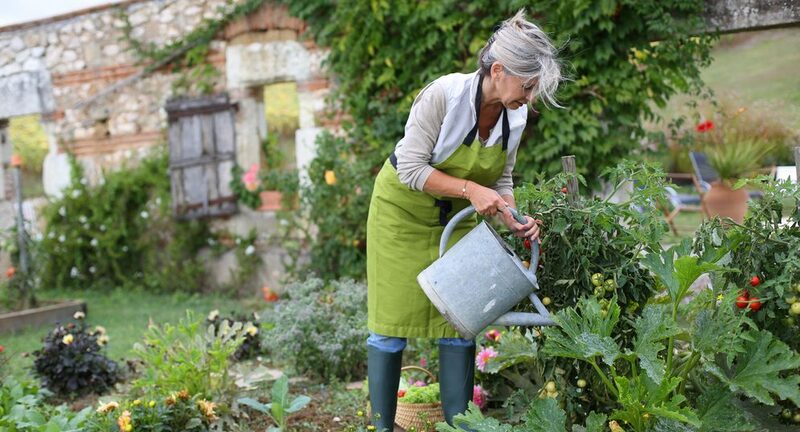 Before you start shopping, it is best to learn what you should be looking for. 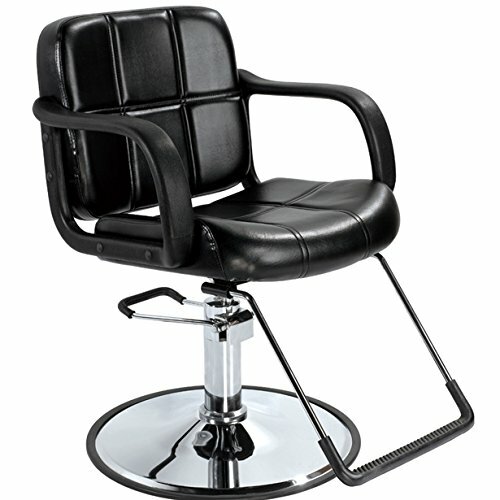 Making an educated purchase will help you find the best salon chairs for your shop. Functionality should be your number one concern for a styling chair. If it does not function by swiveling where you need it to or staying still as you cut and style customers’ hair, then it is useless. 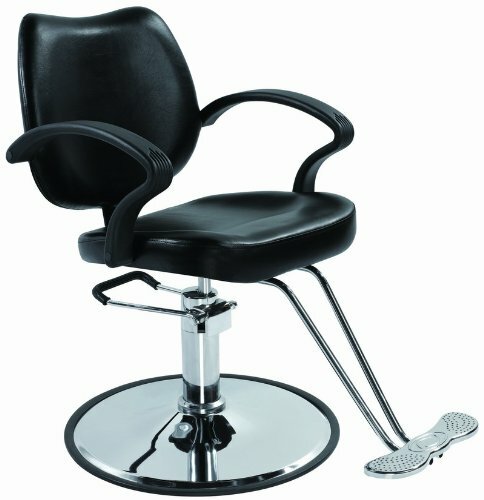 Ultimately, the functions that you need from your salon chair depends on the technique that you use while styling. Some barbers or stylists choose to use chairs that do not swivel, while others will move the chair as they need to while styling. Additionally, having rollers on the bottom of the chair is an option, but is not required. Remember that if you do choose a chair with moving parts, it is ideal that it has a function to lock it in place once you position it. Something else to keep in mind is height adjustability, a function that almost all chairs should have. You cannot always guarantee that your customers will fit into the same height profile. For the best styling job, the chair should be able to move up and down, so you can see the angle of hair that you need to so it is styled correctly. Salon owners sometimes make the mistake of purchasing furniture that keeps up with the latest trend. The problem with trends is that they come and go. Hot pink with sleek, black and white trim may be hot one day and be considered out of style just weeks later. To keep up with times, choose a classic design that will never grow old. Even though you are going classic, you still want to make your salon your own. Check out this article on how to make your salon reflect your personal style. 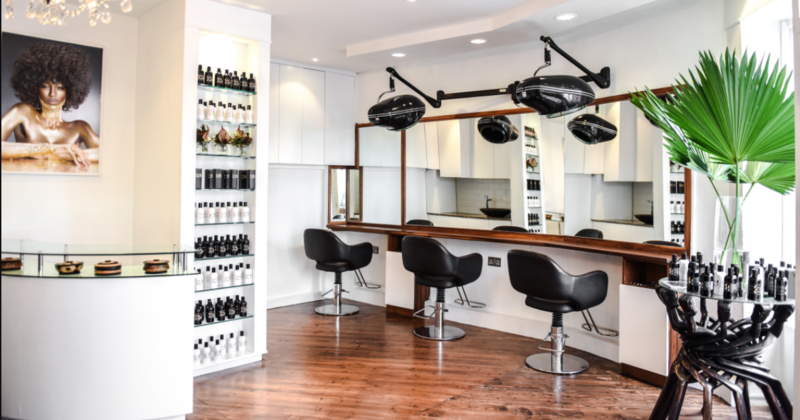 Did you know that once the average salon customer is satisfied with their styling experience, they will continue to return to the same location? Sometimes, even for decades to come. This makes every part of the customer experience is important, from the actual styling job to the small talk. Something else that is going to weigh heavily on a customer’s desire to return or not to return is how comfortable the seating is. You should choose a chair that has sufficient padding, but that is still stable enough that they are supported well. The chair should also provide good back and arm support. The quality of the materials that you select for the chair has a lot to do with how durable it will be. You should also choose a seating material that is easy to clean since you will be cleaning the hair and other debris from the chair between customers. Most chairs are made of leather or vinyl. Vinyl sometimes is soft enough to mimic leather but is more affordable. At the base, you should choose steel or aluminum. 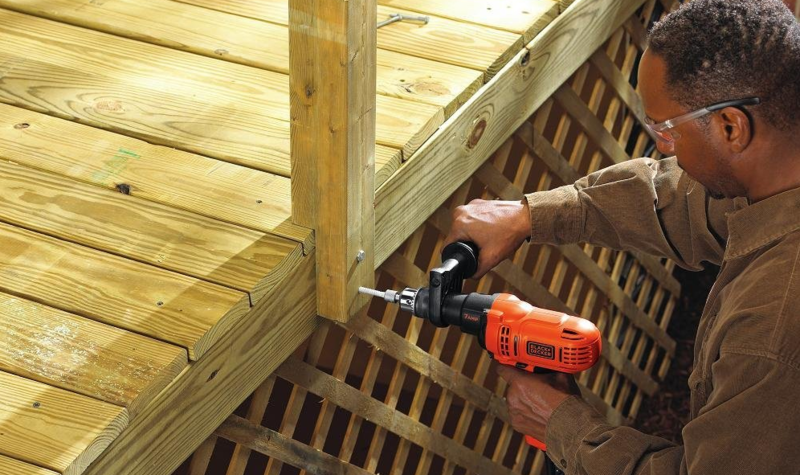 Each can be treated to be resistant to wear and tear, corrosion, and rust. 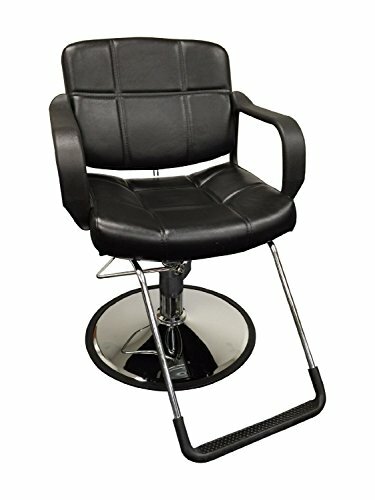 This chair delivers in every are that you expect a quality salon chair too, including in price, appearance, and functionality. 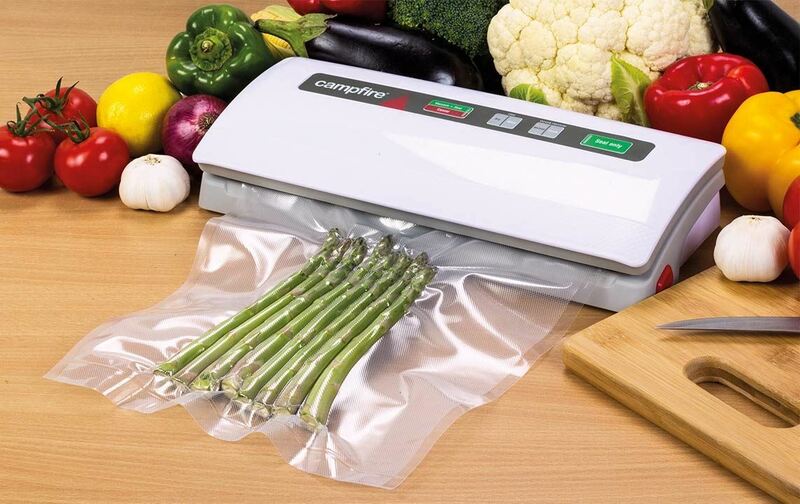 While it is a little more expensive than the other options on the list, it is well worth it for the increased durability and functionality. 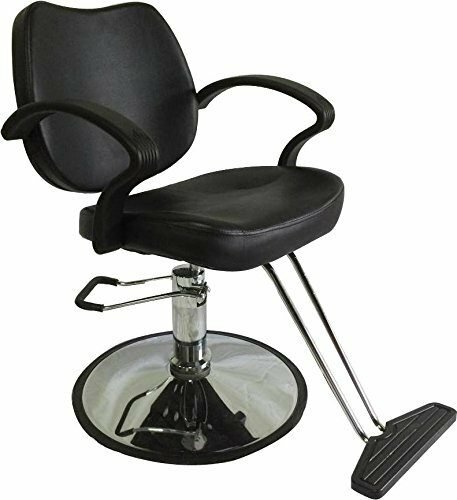 Its comfortable dual-density foam and footrest, 360 swiveling and hydraulic lifting make it an ideal choice for most stylists, as long as they are not too tall to comfortably use the seat.